My best friend sent me a text a few minutes ago and it was right on time. It was a screenshot from her “Sprinkle of Jesus” app and it simply said … Be careful who you vent to. And baby, if this isn’t the truth. This is why a lot of us face more problems than we should, on a daily basis. It’s not because you run your mouth but it’s due to the ones you ran it too. All you have to do is pay attention to them. If they can’t keep their business to themselves, what makes you think they’ll keep yours? This is why everybody shouldn’t be privy to your problems. (Read that again). Sometimes you need to mind your business and let them mind theirs. Oh but this is also why you have to be mindful of who you let into your personal space. We were having this same discussion in my psychology class on Tuesday night because a lot of ministry leaders are dealing with some stuff because of who they thought they could trust. And it’s the same with anybody. You trust certain people and you share things with them, only for it to now be spreading like fire. You have to be careful who you vent too. Being in ministry, there are some things I don’t share with my husband. It’s not because I don’t trust him or that he’ll tell it but it’s because sometimes, there are things that shouldn’t be repeated. Sometimes we have to hush and not talk. On the flip side, if I do vent to him, I know he isn’t going to tell anyone else. And this is needed. You NEED someone you can talk to on those days you feel like giving up and know they won’t judge you or tell it. This is why you have to surround yourself with some folk who get you and who understand. And I’ve been grateful to be aligned with some great ‘girls’ who also get me. With them, there’s some times I don’t want to be Rev., momma, wife, author, encourager, corporate worker and etc. and they get that. And I can vent and rest assured knowing, it stays within the confines of their ears and vice versa. This is why I say again, you need to have someone you can vent to. It doesn’t matter if you pastor a mega church or a small store front. It doesn’t matter if you’re 19 or 90. It doesn’t matter if you’re rich or temporarily out of funds. You need someone in your corner you can trust. This especially means your spouse but also someone else too. Because if you don’t, you’ll find yourself inwardly dealing with some stuff that has the potential to destroy your mind. 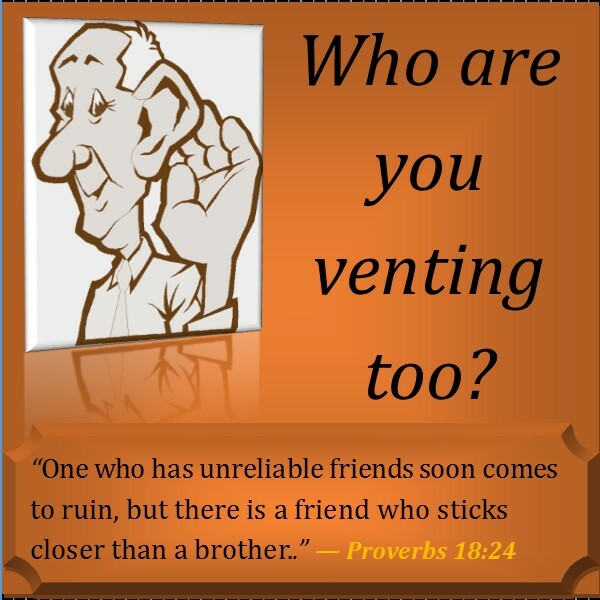 Who are you venting too?